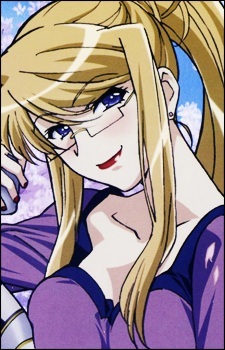 Height: 173cm Weight: 57 kg Margery is a tall, "well-endowed" and mature blond Flame Haze with a drinking habit. She uses the book Grimoire, which is the divine vessel through which Marchosias, to whom she is bound, expresses his will. Her main powers focus around chanting spells and turning into a werewolf. She casts spells by chanting an "Improvisational Poem of Slaughter." Eita and Keisaku look up to her because she saved their lives once. Her reason for becoming a Flame Haze is to get revenge on a Denizen with a silver-colored flame (who is somehow linked to the Reiji Maigo within Yuji). Even before her installation as a Flame Haze, she lived only for vengeance. She was once a daughter of a landlord in medieval time, but after countless betrayals, her father was killed and she had ended up in a brothel. She gained a chance to avenge for her misery and humiliation on her enemies, only to see them be destroyed by the Silver. Her fury from being stolen of the last reason to live had attracted the attention of Marchosias. In the anime, Margery's focus shifts from fighting simply to eradicate Crimson Denizens to fighting to protect the Balance. She notes her fighting skills are no less for the shift in focus. In the light novels, Margery would not only face the Silver in an unsuccessful battle, but would later realize that the Silver had been acting on her wish for revenge in her life of misery prior to becoming a Flame Haze before she nearly got killed by Snake of the Festival Sakai Yuji. Margery eventually recovers when Keisaku kisses and confesses his love for her, giving a new meaning to live forward before kissing Keisaku back in return.